Tower Productions started its humble beginnings out in a garage on Long Island. 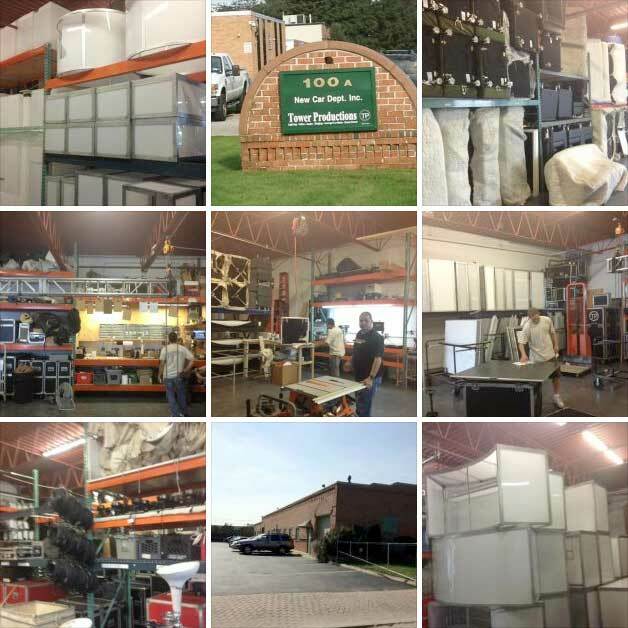 With simple dedication, the company grew into a full-service Event Production Supplier. What made Tower great back then is the same thing that keeps Tower in business now: exceptional customer service in value and attention to detail. Today, we are one of the leading event production companies NYC has to offer. Additionally, our technical expertise in video, lighting, staging, event furniture and dance floor systems completes the package in supplying your Corporate Events, Launch Parties, Galas, Bar / Bat Mitzvahs, Sweet Sixteens, Weddings, Private Functions, Fundraisers, etc. with professional and quality projects, completely within budget. We understand how important planning and producing your event is and we will collaborate with members of your team for a stress-free production. We offer the best in LED or conventional uplighting, dance floor lighting, pin spotting and stage lighting. Whether it is a Corporate Event, Launch Party, Gala, Bar / Bat Mitzvah, Sweet Sixteen or Wedding we will work with you to develop a theme and set the mood for your event. We will deliver, set up and operate the equipment throughout the event to ensure that everything runs smoothly. This is why Tower Productions is the first choice of event production companies NYC. Video projection is a powerful tool that can add energy and movement to any event space. Whatever scale of the event or video requirements, we are capable of handling it all. We will help you put together a package that best implements your vision. We offer a huge inventory of video equipment including HD projectors, plasmas, led screens and a full range of camera equipment. Simply put, as your event production supplier, we provide not only the best equipment but also the best technicians to make certain your event is a success. LED Stage Decks are the perfect compliment to any production setup and will add a great look to your event. Whether a Concert, Runway Show, Corporate or Private event, our stages will be sure to add that finishing touch to “wow” your guests. We also carry a full supply of conventional staging to satisfy any size requirement. Event Furniture LTD is a top-end event furniture rental company. Our collections of sleek and modern furniture create an atmosphere that is sure to give your event a distinctive and sophisticated air. We offer the finest sofas, illuminated tables & bars, stools and a huge assortment of accessories for the special event industry. Our attention to detail and passion for what we do will show at your event. Our selection of furnishings and accessories are designed specifically for the event industry. We are always creating new designs and concepts that keep us at the forefront of the industry. Whether an intimate private affair, Sweet Sixteen, Bat /Bar Mitzvah, Quincenero, or large corporate events such as Launch Parties, Galas, Fundraisers, Trade Shows, Grand Openings, we are the best-equipped event production companies NYC to help make any event spectacular. When searching for event production companies NYC, know that we are the top provider of dance floors serving the event industry with a variety of options. Whether a traditional white, black or LED dance floor, we can fill your needs and complete the finishing touches to any ballroom or celebration.